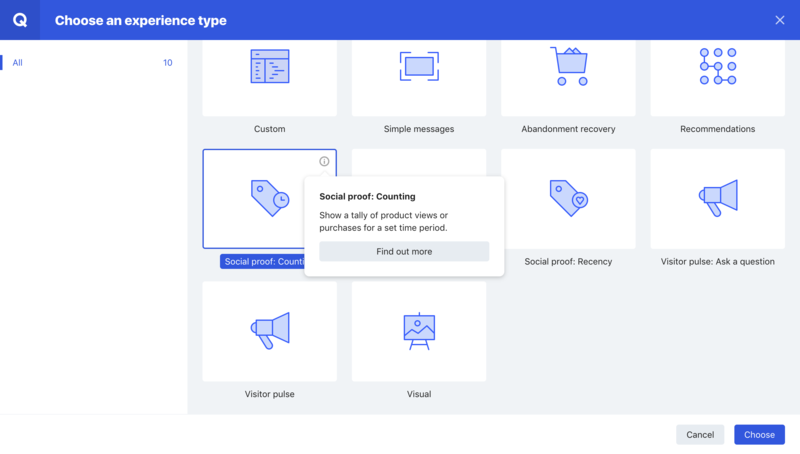 Review: "Qubit - Segmentation, Personalisation and Optimisation"
Qubit is used within the e-commerce team to serve targeted functionality, segment live visitors and test UI and UX theories. Currently, it is being used widely to improve international personalisation. Qubit provides a platform to quickly implement ideas for functionality and gives summarised results to validate (or invalidate) UX theories. Qubit allows relatively easy segmentation of our audience so that we are able to conditionally affect our site for visitors. Qubit offers a mix of simple and advanced tests that can range between very broad segments of our audience and extremely specific ones if necessary. We often use simple experiences to serve time-limited features onsite. Some of the reporting within Qubit has been overly simplified in the past, a point they are continually addressing. At times the syntax of experience (test) creation can be specific to Qubit and so there is a slight learning curve for developers. Unless developers have much time to allocate to creating tests in Qubit, marketers may potentially find simple tests limited. I would recommend having someone in-house as we do. Qubit is well suited to a medium size organisation with enough resources to fire tests frequently and act on findings as they become available. An important detail to remember is that final implementation is often quite different to testing, so the ability to then transfer winning variations to your live projects is crucial! Review: "Qubit: Testing and Optimization Ideal for Nimble Digital Commerce Organizations"
The Digital Commerce team used Qubit to conduct multiple split tests and targeting campaigns on our website. We used the tool to implement both data driven testing initiatives and to provide personalized or custom content in specific scenarios. Qubit's professional services helped us overcome bandwidth limitations in designing and implementing multiple campaigns. Qubit's entire team is extremely responsive. My representatives responded to questions and requests quickly both during and after business hours. They understood our needs and prioritized appropriately to deal with urgent and emergency issues. Qubit's creative and UI/UX resources were very effective at providing content and matching the look and feel of our existing experience without impacting our teams. They responded quickly to change requests and did everything in their power to make sure the finished product matched our shared vision. Qubit excels at providing ideas and insights that drive great tests. We ran several very successful tests based on their recommendations, and when we saw unexpected results, they helped us understand the behavior we were seeing. They recognized the unique challenges of our business and focused on addressing those issues rather than providing us with boilerplate suggestions. Our biggest challenge with Qubit was around integrating with our existing analytics tools. Qubit offers robust solutions designed to work in concert with their testing tools, but working with other solutions can be complex and occasionally frustrating. Qubit was able to offer integration with our commerce platform, but we were never able to align from a technical perspective. This may have been more of a problem with the customization built on top of our platform; still, it did leave us with some limitations. Qubit provides some really cool tools that we never got to take advantage of during our contract. I think we would have benefited a lot from getting better calibration and training on all the customer facing tools at the outset. Qubit seems to be geared toward clients looking for a total solution, including professional services and creative and development resources. I'd definitely recommend Qubit if you lack internal resources to fuel a lot of testing and personalization initiatives. If you lack flexibility in your commerce platform or your analytics solution, Qubit will still be able to meet your needs, but I don't think you'll get the most possible out of the relationship. If you're particularly nimble or not yet committed to an analytics solution, I think Qubit provides a fully featured, premium product backed by a professional, responsive, competent team. 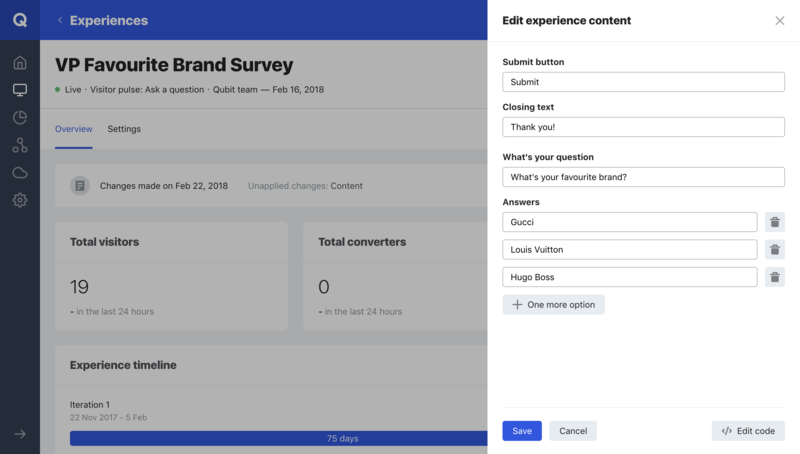 Qubit Review: "Great platform and service to test your ideas and ultimately increase conversion"
We use Qubit to gather user feedback, analyse user behaviour, form hypothesis and build MVT and A/B tests and finally, monitor the results. The platform is predominately used within the eCommerce department however test results are shared throughout the organisation and ideas are encouraged from all staff. Using Qubit allows us to quickly test new ideas; helps us make important design decisions; gives us a better understanding of what influences buying behaviour, helps steer our development roadmap and most importantly, improves overall conversion. Great A/B test ideas based on both quantitative and qualitative evidence. The Qubit consultants and engineers we have worked with have an excellent 'can do' attitude. Excellent communication and clarity on test results. There is room for improvement on the velocity of getting new tests developed and QA'd. Depending on the test/experience it can add extra weight to page load times and cause 'flicker'. Qubit may not be best suited to businesses with little or no budget, culture or capacity for conversion and experience optimisation. We currently use Qubit in the ECommerce department. We use this to A/B test hypothesised theories on our website. We have been able to make solid design and UX based decisions on the development of our site because of Qubit. Split testing - Making analytical based decisions on results of split testing has been vital over the last 18 months, and will continue to shape the way we work. Data - The amount of data Qubit captures is still overwhelming to see, more support could be offered in what we use this with, and how to manipulate, but it easy to see the size and range of what is collected. Decision making - When your results become concrete Qubit breaks your results down into key metrics, this is massively useful when making a decision on your next steps. Reporting - Cannot cross-pollinate your results into customer segments on the site. Easy editor - Although great for desktop, mobile and tablet hasn't been thought about, in a mobile first world this should start to become a priority. Loading of tests - Even when our pixel is implemented sync or async the test will always load after the page is completely loaded. This does put some doubt into results. If you don't have development resources Qubit can solve some simple problems for you. Similarly if you do, and they are trained on the platform, the possibilities are endless. It may not be appropriate on parts of your website with smaller traffic, as your results may never reach significance. Review: "Qubit - Why we use it and why you should too." Qubit is used by a wide variety of departments within the company and in many different ways. My first experience with Qubit was when I had been tasked to change one of the tracking tags on our website. Due to the seamlessness that Qubit delivers these tags I didn’t even realise that we had a tag manager and was amazed to find out exactly how powerful and useful Qubit was. These days I use the Qubit services on a daily basis to create and deploy A/B tests to our website to improve customer experience and increase conversion rates. The feedback and help received from Qubit is one of their best aspects. At any point during the creation of tests, if I had any concerns or queries I could contact someone from Qubit and expect a reply within the hour. The ease and speed in which using the tools Qubit provide became second nature. Everything you've come to expect from an IDE packed into a browser window, from intellisense to SASS compiling. The documenation regarding the Deliver and Opentag services is sometimes lacking. If it does exist then it isn't usually enough for a beginner to get started with. The simple mode within Qubit Delivery could do with slightly more to it than it currently provides. Being able to create prebuilt elements that can be used in simple mode would be beneficial. At the moment these premade elements are limited to a few that fit only very niche requirements. For any website that will handle more than a few tracking tags or more than a few hundred users I would say Qubit is a must have. It simplifies so many different parts of bringing in, tracking, keeping and pleasing customers with no down side. Qubit Review: "A/B tested content delivery"
We use qubit on a daily basis both for A/B testing and content delivery. Implementing new functionality in qubit is much faster than asking developers to made some changes (and we actually measure the impact of those changes!). We also use qubit for personalisation and delivering "hand-picked" offers for selected segments and groups of customers. By using qubit we are able to display on the website different offers for customers who use to buy products from different groups. User Review: "Queue up for Qubit!" We use Qubit solely within the Marketing department as this team is responsible for onsite content, UX and of course marketing/merchandising activity. Being able to inject content into the exact places you want, and further target segments/devices etc. easily. Now that we've got our UV setup correctly, it's very powerful in its ability to target users, and pinpoint experiences without limitation. Capturing exit survey content and details in one place is very useful. Reporting could be improved, providing more stats such as projected value calculation, clicks, impact from other experiences live etc. Content production should be a hybrid of Basic (full GUI view) and Expert (only code view). We should be able to access the HTML/CSS and write this ourselves, letting the system manage the JS. Also, content production should be responsive - allowing us to build experiences for Mobile and Desktop in one experience. Qubit engineering and QA takes a long time to turn around. We should be looking at days rather than weeks. Setting a go-live and end dates to experiences would be really useful! Qubit is great for us, an online-only retailer that stocks niche/condition based lines. User Review: "Qubit all the way!" Qubit is currently being used by our Omnichannel and Digital department to set up new experiences, test new experiences, understand trends and finally make an informed decision to go for a permanent solution on our website platform. It currently solves our key problem of lead time to have experiences set up and running on our website platform as it requires releases whereas Qubit provides a way of doing it almost immediately. Qubit Review: "Great technology and a great team!" Qubit is used for A/B testing and conversion rate optimisation on our website. We’ve been using Qubit for over 2 years. They are easily up there with the very best of all our suppliers. I love the fact that the tool allows us the ability to test out new ideas without tying up IT resource or incurring costs from external development agencies. In addition to offering intuitive and user friendly technology, the support team behind the solution is excellent. They are a constant source of new ideas and suggestions and are absolutely committed to helping us achieve our business objectives. Qubit have continually improved their technology since we've been using them. At the moment I can't think of any areas for improvement. I would highly recommend Qubit to organisations looking for a powerful but intuitive tool for conversion rate optimisation. Qubit Review: "Excellent all rounder"
We are using Qubit primarily to create experiences and run our A/b and MVT test programme. As well as this, we utilise other products of theirs such as behavioural recommendations and also take part in beta programmes. We are aware of personalisation capabilities however, this is something we are only using in a limited capacity at the moment but plan to take more advantage of in the future. By being able to test solutions to different problems that we identify, as wall as try out new ideas, Qubit helps us to minimise risk and ensure that we not only increase our profits but also, and more importantly, deliver the best experience for our customers. The testing platform itself is continually evolving. This means that we are always able to try new ideas as well as quickly and efficiently put others into practice. While they do work very closely with us, especially our success manager, more involvement on a technical level or a dedicated engineer, would be a great advantage. We develop a lot of experiences in house and, like all companies that dev in house, we have our own way of working. A dedicated engineer that got to know us better as well and understood how we work could only help. Sometimes, a few errors can get through QA due to this. Qubit are very well suited to developing/implementing testing, data analysis and personalisation. They have extensive knowledge across the business which they obviously draw on when required. Very good service overall, they are focused on helping us achieve our business goals using their technology and do approach us with new opportunities while not being pushy for additional business. Would recommend Qubit for anyone looking for not just a platform to run tests/personalisation but a partner. 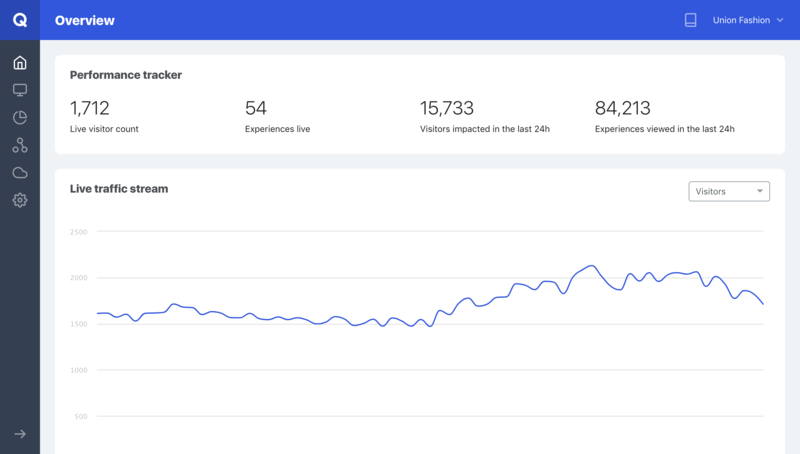 Qubit Review: "Good testing and personalisation platform, not suitable as one-stop-shop"
Qubit is used to create either A/B tests or personalisation experiences. A/B tests are typically developed by a dedicated person in the Tech team, based on a marketing request. They are not meant to be reusable. Personalisation experiences (e.g. banners, marquees, etc.) are created by a dedicated person in the Tech Team, based on a marketing request. They are then reused and modified by the marketing team to update the copy, images, triggers, etc. A/B tests for front-end related changes. Complex experience personalisation (requiring coding). Multi-variate test or complex test setup. Well suited when used by an engineering team to build test or complex personalisation experiences, including with complex segmentation / trigger rules. Not suited to be used as DIY tool by marketers with limited/no technical knowledge. Not suited for server-side testing, including pricing tests. Not suited for complex A/B or MVT tests, due to limited control over test parameters. 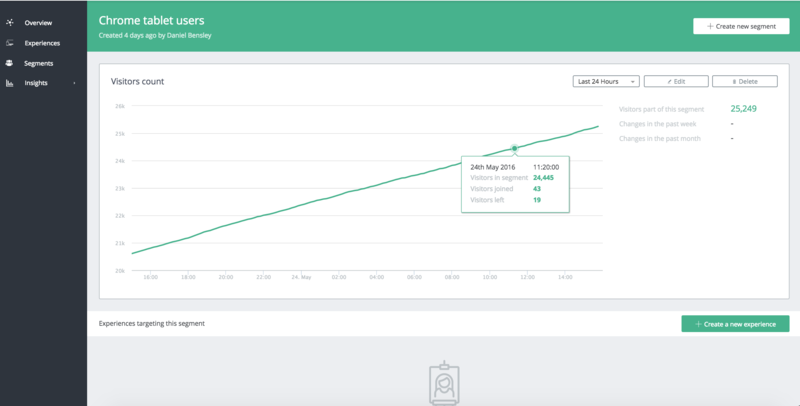 Qubit Review: "Powerful optimisation tool"
We currently use Qubit as a tool within our digital marketing team. With data-driven insights, we create A/B tests for several of our websites, with the main goal usually being to increase conversion. We also use Qubit to serve website content to our customers in order to help us promote current offers, and products. Account management is fantastic, and you are always kept aware on the progress of tasks. Qubit is not afraid to make suggestions/recommendations to your ideas to further improve them rather than just accept your initial ideas without question. Website event tracking has proved extremely useful for our analysis. I have experienced multiple glitches with the simple mode editor. Tests sometimes take a while to build and QA although they always try to prioritise based on your feedback. User Review: "Qubit's not me it's you." Qubit is being used in multiple functions. Our company uses both the Opentag tagging function on the website and also the 'Discovery' function for CRO/UX and feedback collection on-site. Qubit usage is entirely held within the Digital Marketing team. It addresses the issue of providing a tag container onto the website and also providing A/B testing needed for CRO. It also serves as a mechanism to collect qualitative feedback online from customers. The system is easy to use and understand, the statistical output has been customised to be understandable for someone with a low knowledge of inferential statistics. Customer support for Qubit is very strong dependent on your contractual situation with them but the staff are happy to provide training and advice, generally at no extra cost. The tagging solution is highly functional and does not appear to cause any faults on the site. The price can be very high considering alternatives. There is little flexibility in terms of designing your own tests. It doesn't do particularly well with multivariate testing. The back-end statistics have to be pulled from the Qubit offices for items such as by browser, OS, device type etc. rather than being made available to the user. [Well suited] for a site that requires little experimentation aside from occasional A/B testing by non-CRO experts. It would be less suitable for a new website that needed heavy optimisation and required large amounts of data mining from the results and possibly multivariate testing. "Qubit - Review of a Happy Customer"
Currently Qubit is being used primarily by our Digital Product Management team. Our Product Manager is managing the tool as well as our relationship with Qubit. The eCommerce Merchandising team provides input as to what types of test we run, but for the most part it is used by my team (Digital Product Management). We're primarily using the tool for A/B tests, experiences, as well as data analysis. 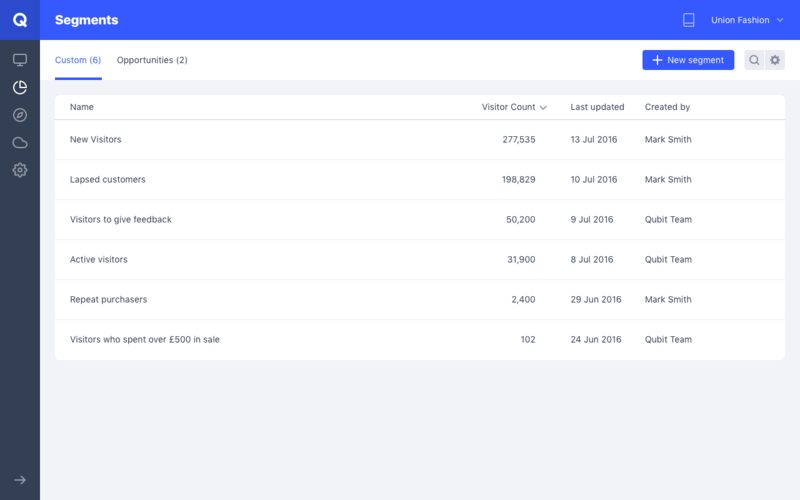 The Qubit suite provides in depth analytics that we'd love to dive into even deeper, but with limited head count it's been challenging to dive in as deep as we'd like. We hope to broaden the team in the coming months and devote more time to analyzing our results and rich data that we've been collecting to tailor future tests and experiences. Communication - Qubit is awesome at communicating with their clients. We have weekly calls and communication via email pretty regularly. They provide honest and helpful feedback and have yet to lead us astray. Making Suggestions - Qubit does a great job of suggesting types of tests to run based on our particular customer. They are also very open to hearing our thoughts and opinions as to tests we'd like to run; they provide feedback as well as the best means of execution. Deliverability - Qubit delivers when they say they will, and if anything is ever delayed, they make sure to communicate it. Decipher can be a little overwhelming. Maybe providing more training here would be helpful - then again maybe that's just me since I'm not in there everyday! Qubit has been a wonderful partner. They've always maintained open communication, hand-held when we needed it and pushed us to try things we may not have on our own. They are very much an extension of our team and we value their relationship. They're great at providing suggestions as to which tests we should try based on our specific customer. User Review: "Qubit enhances us!" It is used by the e-commerce department to improve site UX, A/B split tests and implement new features such as social proofing. It enables us to test things before we commit to a permanent change in addition to building bespoke customer experiences for key marketing events like Christmas and Valentine's Day. It works well across responsive platforms. It can build bespoke and targeted experiences for customer segments and display relevant content in order to increase conversion. From a customer's perspective, all Qubit experiences are implemented in the style of your website; the customer journey remains seamless. They struggle to juggle our international and UK workload simultaneously. The UK often takes precedence because it is a larger proportion of our traffic. It can take too long to update experiences - but we are an inpatient brand! Qubit suits us because we don't have an in-house development team so it enables us to build A/B tests before we spend money making permanent changes with our agency. They push our creative boundaries and support us in offering on brand and out of the box experiences for the likes of Christmas etc. 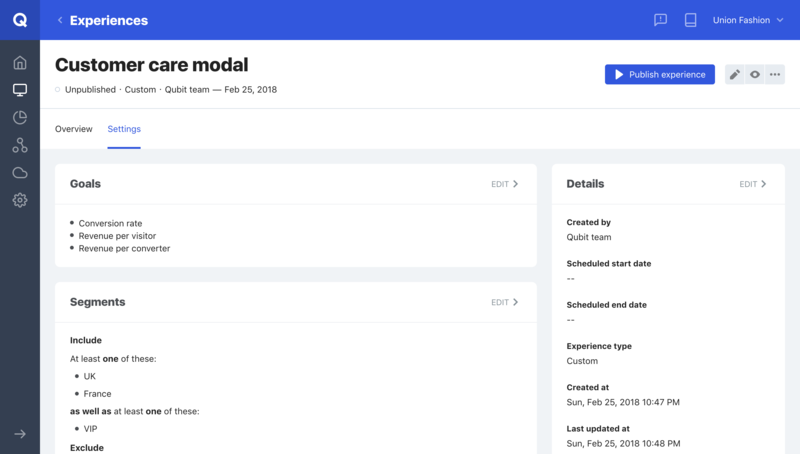 Review: "Qubit: a great testing and optimization solution for product and marketing teams"
Qubit is used by few departments: BI, marketing, and product. The whole organization is participating in the process of A/B testing and is feeding into it. We test new features, improve basket and registration flows and test UX improvements. Qubit is also used for quick feature solution for marketing team when they need a pop-up or a countdown. Excellent support from the Qubit team. Qubit is a very data-driven platform that allows sophisticated segmentation. The platform is constantly updated. There is no ability to switch between simple and custom build modes. There is no insight into the full data set without extra plugins. Qubit requieres extra work to match the Tealium data layer to the Qubit one. Qubit is a good solution for a medium or a large size organisation. Ideally, there should be an internal team of experts that can use the platform effectively and have a deep understanding of the A/B testing and UX. I think Qubit may be too complicated for a small company that doesn't have enough resources and the right people on board. Review: "Qubit - saving development time is a big plus"
Mainly used by marketing but also across IT, Qubit allows quick and easy A/B testing of potential features to feed into the software development cycle, saving us time wasting development resource on features that customers do not want. We have also used Qubit to get very quick "mini features" out which are required as a result of legislation or poor customer experience and feedback. The A/B testing is good as it is so quick and easy to set up and see results - a custom A/B testing framework can be very complex to set up but this requires little development expertise to get meaningful output with. Script management is really useful - no more development requests to try out a new tracking script. To be fair Qubit have improved the UI greatly over the last year or so but previously it was very easy to make mistakes and publish to the wrong site. It feels slightly bizarre having to type "PUBLISH" into a box every time you want to publish to your live site - a double check is very sensible but this one feels a bit strange - it works though. A/B testing and script management is what it is used for here, and it does a good job. It's not appropriate as a substitute for doing the actual development work and sometimes this can be forgotten by marketing. Qubit Review: "A lot of power in a small package"
Qubit is being used by the whole company to support various requests but only implemented by the UX department. A/B testing is its primary application but it also supports business requirements for rolling out quick changes that would normally have to go through a much more convoluted internal process of releasing updates. You can run multiple tests at the same time. It's a web app so it can be accessed from anywhere. It's lacking version control for the markup. 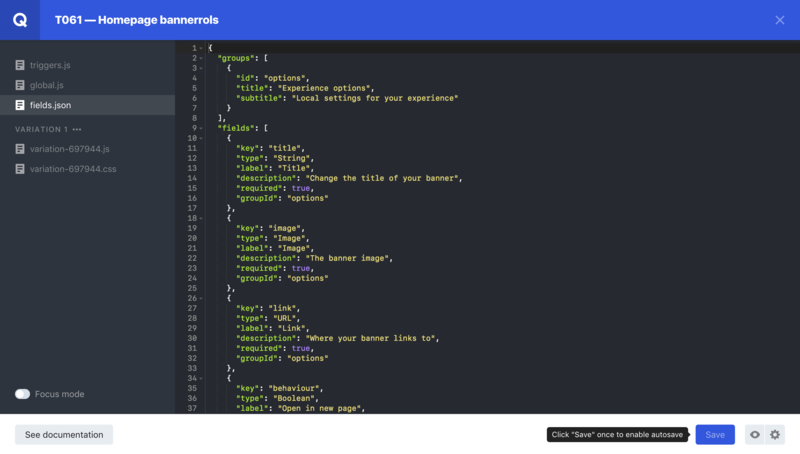 More detailed guide for developers with up to date examples would be nice. There are no clear standards of coding up the experiences so quite often you need to try different ones. Qubit is definitely a right tool for quickly deploying small tests and updates. One person with the right skillset can implement and manage quite easily a significant amount number of experiences in a short time. I wouldn't recommend it for long term fixes or pieces of functionality that should be implemented on the back end side. Also, the load time can be an issue in some instances. 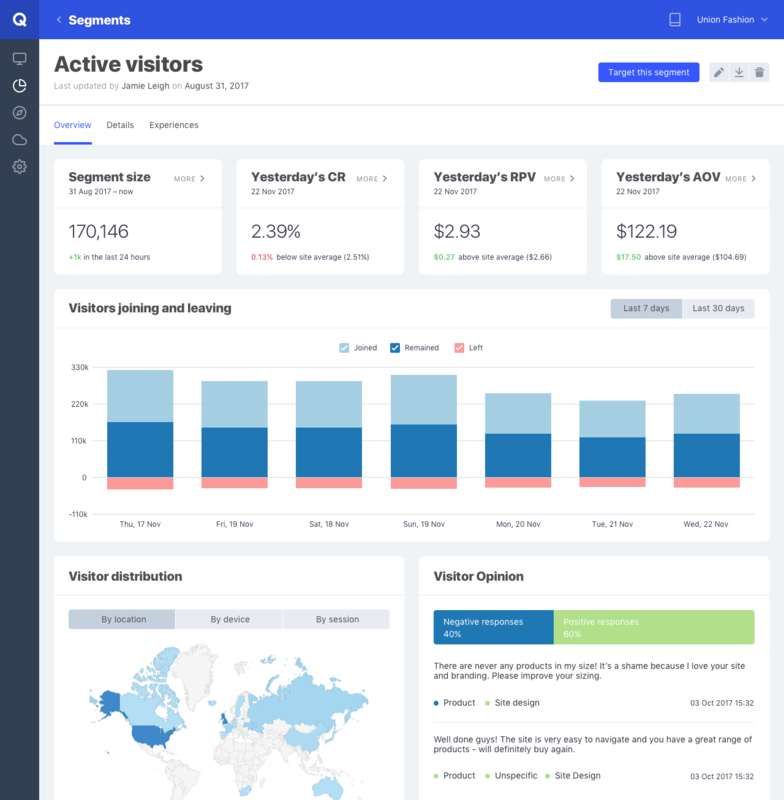 Qubit Review: "Solid tool to monitor and control the user journey"
We use Qubit to track our website visitors and give us information about where they are coming from, what parts of our site they are using, and what is causing them to convert. We also use it to serve up personalized website experiences designed to increase online conversion rate and help to lower our cost-per-lead and increase the ROAS of our online advertising. The interface is a bit "industrial"
Could be more user-friendly and more "marketer-friendly"
Qubit is good for holistic website testing and helps to give a company an overall view of what users are doing on your website. The team at Qubit is happy to help with implementation and other issues that arise when you need to use their service. They can help to drive your testing schedule. Review: "Qubit is more than software as a service, it's also service as a service, and that makes a big difference"
Qubit was implemented in June 2016 following solutions reviews. We migrated from Monetate to Qubit. It is used within the customer marketing department by a CRO expert, and supports multiple business units in editorial, brands, as well as sister companies or acquired businesses. It is used mostly for conversion optimisation purposes through A/B testing on transactional websites (subscriptions, events, e-commerce, etc.). Qubit provides an end to end solution for A/B testing and conversion optimisation, and includes more features that enable us to capture customer specific data. Qubit's key strength is the hands-on support from the support team. Another strength is the ease of use for front end developers and the ability to roll out tests or UX "simulations" within minutes. Providing an interface that would enable "non technical" teams to use the software would be great. Automated reports and dashboards to share progress of tests with stakeholders in a readable format would be brilliant. Setting key objectives of the test beforehand and being able to determine on the interface which KPIs matter and should influence progress of the test would be appreciated. User Review: "Qubit are highly recommended"
[Qubit] solves our A/B testing and optimisation needs and is used by a number of departments. Review: "Qubit and data driven decisions for the win!" Qubit is used to enhance our websites across all of the business for CeX (but not for subsidiary Designer Exchange for contractual and cost reasons). It has been deployed on websites for all 12 CeX territory websites. The use of it is driven by members of IT (including myself) and Marketing. It allows us to try new ideas quickly without interrupting internal resources, therefore can respond quicker to certain things, we can a/b test those ideas, and use the data to determine if they are of benefit or not, putting an end to many conflicting opinions because multiple ideas can be tested. We can also personalise those tests and experiences using the data we pass to Qubit, which we are not currently able to do. That all applies to the Qubit Personalisation product along with Universal Variable. However we also use product recommendations which piggybacks of the previous mentioned products to produce something we would not be able to create in house at the same speed and quality. WIth the data we send Qubit, we and they can develop many more uses which alone we would struggle to build, such as personal and targeted email marketing and many other website enhancements. Market sector and industry knowledge. Using this, they have given us some excellent advice of what experiences to try, and using the data they gather from all clients are able to provide continual feedback and suggestions. This is a a credit to the staff they have exposed us to. The platform performs amazingly well. We have almost zero issues or downtime in the time we have been using them. Web experiences produced by Qubit always come out at a very high standard. Guidance / training on how we can run our own experiences if we have the resources. It's well suited to an ecommerce environment where goals can be measured with sales and similar measurements. Also, to really make use of the A/B testing with statistical significance, you need to have good traffic numbers. However, while a low traffic retail site would still benefit from many of the other features of Qubit, it's less appropriate for any other type of website where the goals are harder or impossible to track. We use Qubit for local messaging, A/B testing and product recommendations on the home and product pages. It is just used in the eCommerce department, it is a huge part of our website and on-going strategy. The team is strategic and gives great advise and direction. The back-end system is easy to use and manage. There should be more templates so that people without HTML skills or knowledge can create tests. I do believe this is being developed. Qubit has a great team that advises with new tests we can do. They come to our offices and we have a a strategy meeting to see how we can improve the business. They are good at giving examples of success with other vendors and why we should do the same test. I have seen businesses use Qubit as a CMS which it isn't; I feel that they need to encourage their clients to get their development team to implement the test rather than just have it live on in Qubit. Qubit Review: "Source to Resource: Balancing Internal and External Testing"
Limited IT resources mean that we do not have time to make all of the necessary integrations or tests we would like to see. Qubit helps us move with more speed to market advantages. Tara and Trip have been excellent contacts and resources for questions and answers. Their Service and support and extremely helpful. The ease of test implementation is very handy. Requirements are discussed, the project is scoped and development starts. Updates are provided as steps are accomplished and tests are visible throughout the entire test period. The provided "opportunities" section helps define what next steps may be taken from a project management standpoint. This is a two edged sword. 1) It provides some light directionality communication on what next mid or low tier priorities exist. 2) This also proves the investment of the tool by adding a third voice to the conversation and consistently communicating ROI in potential dollars to be gleaned from the work that could be done. I have yet to be "impressed" by any of the design elements supplied by the design team. I know that they are working from a billable clock perspective, but many of the designs require two or three rounds of refinement before I have been happy with their finalized work. Even then, the design itself seems somewhat vapid. It may be that they have not been empowered to challenge formats or pages more specifically, but more often than not, I wonder what their background is, as many adjustments seem like design 101 from an eCommerce perspective. The timeliness of design turnaround is the least expedient of the group. Tara's ability to launch a project is excellent, her developers and QA team seem to have legitimate 48-72 business hour turnaround times, but the design feels like it takes much longer. This is then compounded by the aforementioned required set of approvals during which additional adjustments are made. Again, I do not know what requirements are provided, but it is the only part of the relationship that I would deem a "pain point." 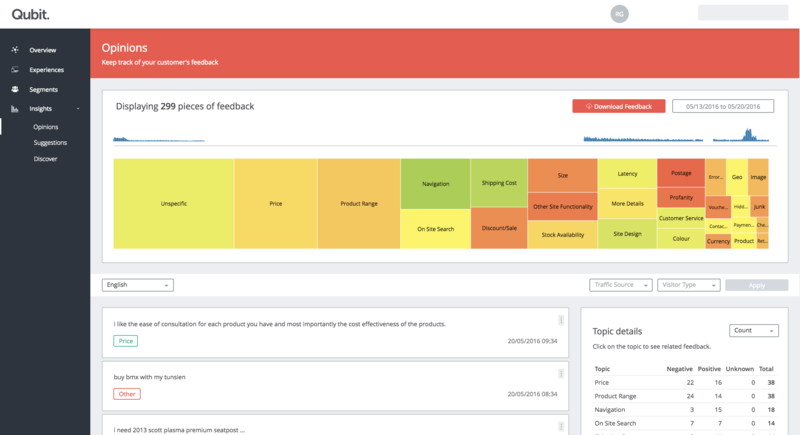 I would like to see a more Robust Customer Feedback tool or the addition of a automated report. There are plenty of false negatives or false positives in the reporting and so the breakdown within the tool doesn't help a great deal. Segmenting by type is more helpful, but the positive negative is often not correct. Qubit works well in certain situations, but any internal backlog in IT, specifically Data Integration or Development, will run into consistent issues between published tests, the ability to hard code winning tests and the actual use of the data engine that Qubit provides. Having a fully Functional IT team is necessary in order to make the best use of the tool. This is somewhat at odds with some of the work we are requesting them to do for us, based on the fact that our IT backlog is significant. In short, we are using Qubit to provide additional IT bandwidth, but Data integration requires a decent amount of IT bandwidth. Used for A/B testing as we have limited development resource and lead times. It's being used by the UK eCOMMERCE department only. It addresses the need to understand how to optimise the site to improve conversion, UX and CX. It also supports us with the ability to make faster changes to the site which is one of our largest restrictions. Good functionality, team of engineers and designers on board - feels like you're in expert hands. Advanced functionality with endless possibilities. Good account management set up means you'll always have a contact, training and ongoing support. Cheaper packages or discounts on additional modules for existing and loyal users. Faster speed - often we're restricted on the timelines and queues with engineers and can only run a test a time. High staff turnover - not ideal for daily contacts and relationship building. If you have an in-house UX team I would say it's less suited. If you are part of a larger scale business with more restrictions and less in-house expertise this is perfect. Data is collected using Qubit’s own QProtocol data layer, or by integrating the user’s existing model via our API. Quantitative visitor behavioral data is combined with qualitative visitor feedback and ingested data from Qubit users' other systems of record enabling them to identify areas of the site and customer groups to optimize and target with personalization experiences. Users can A/B test any changes to their site using Qubit, and the user interface lets them know what the test results are. Qubit Pro segments metrics page, showing the key metrics and activity for an audience segment.Segments overview page in Qubit Pro, showing a list of user-created audience segments.Selecting between the different types of experience in Qubit Pro to create a new personalization.Using a Qubit Pro template to create a Visitor Pulse Survey to gather user information.Using Qubit Pro custom mode to create a homepage banner.The overview metrics page in Qubit Pro.Setting the goals and segments for an experience to be tested in Qubit Pro.